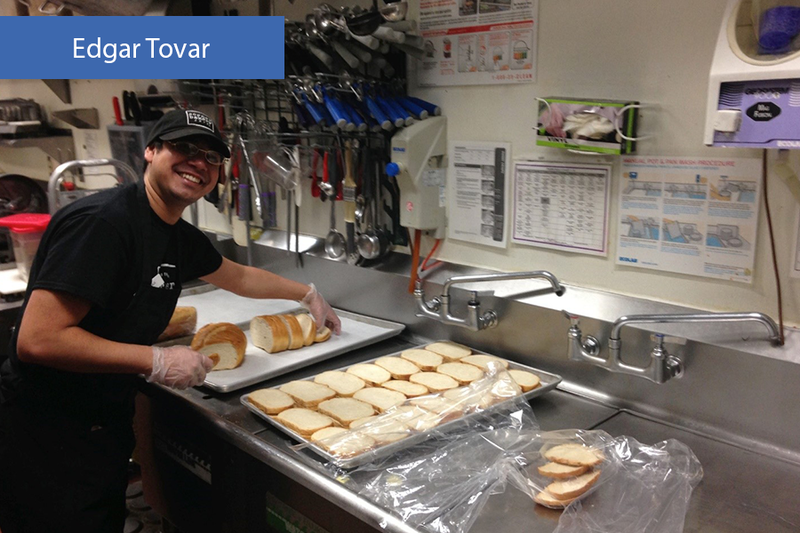 Edgar started his first job at Corner Bakery as a dishwasher and sandwich maker with job coaching from JNCS staff 100% of the time. After a year and a half he only needed 20% coaching at work. However, he relied on staff to provide transportation to and from work. He trained hard to become a server there, and started in that position with 100% coaching. He loved serving and was again at 20% coaching after a year, continuing with the responsibility of both roles. At the same time, a little bit of support from his staff helped him start commuting independently. Not long after, he began he began using the bus consistently and getting rides from co-workers and family. Three years on, Edgar wanted to look for a new position where he could be more interactive with customers and try something different. JNCS supported him to look for a new job and VERY soon after he was offered a job on the spot after interviewing at Chuck E Cheese! He started in October 2016 and has been trained in multiple roles there, including playing Chuck E. Cheese himself! His job coaching there started at 100% and currently he receives coaching 30-40% of the time. Plus, he is getting to and from work independently! Edgar enjoys his new job and his managers have given the JNCS coach the green-light to fade back; he works great on his own. Next step- Edgar will gain confidence and build stronger relationships at work with natural supports so he feels comfortable with the coach fading. Keep up the awesome work Edgar!